First, thank you all for your prayers and thoughts regarding my Mother-in-law. You have blessed our family so much. I feel so priviledged to be part of a community of such precious people that always rally around each other to cheer them on and hold them up in prayer. You are all truly a gift from the Lord. Thank you. I wandered through a Thrift Store that I had never been in last week, and of course came out with a few treasures. Books and silver are always a treat. The glass insert is missing, but just look at the beautiful engraved design all around the top. LOVE it!!! A little miniature book box, cute for displays and for $1, it was mine. I'm always looking for volumns of books, and there were these 5. At $2.99 each, I just had to have them all to add to the library shelves. These are classics and of course I had to have them. They were also $2.99 each. I am almost done with the Christmas shopping, so I thought I deserved a treat. lol I seem to treat myself quite often. Be sure to visit these wonderful ladies and see all the treasures everyone has come up with. A book collector, yes, I confess. Like you, I try to buy sets of books. I, especially, get excited if I find book spines with a numbered series! Those are getting rarer to find. Thank you for allowing us to see your newest treasures. I've got to find a better Goodwill for some serious shopping in the New Year. Happy hunting, dear! That's the way to go, Marty. As far as I'm concerned, whoever is doing the Christmas shopping deserves a treat! : ) In fact, I expect I will be treating myself when I hit Kohl's this week. Those little books are great and will make for wonderful vignettes on your tabletops. What a hidden gem you found in that little silver piece. I could just see you opening the lid and displaying something inside it. Marty, you found some great books at the thrift store. You know I am always on the look out for books like that to add to my shelves, too. Love the silver butter dish. You do deserve a treat, Marty. 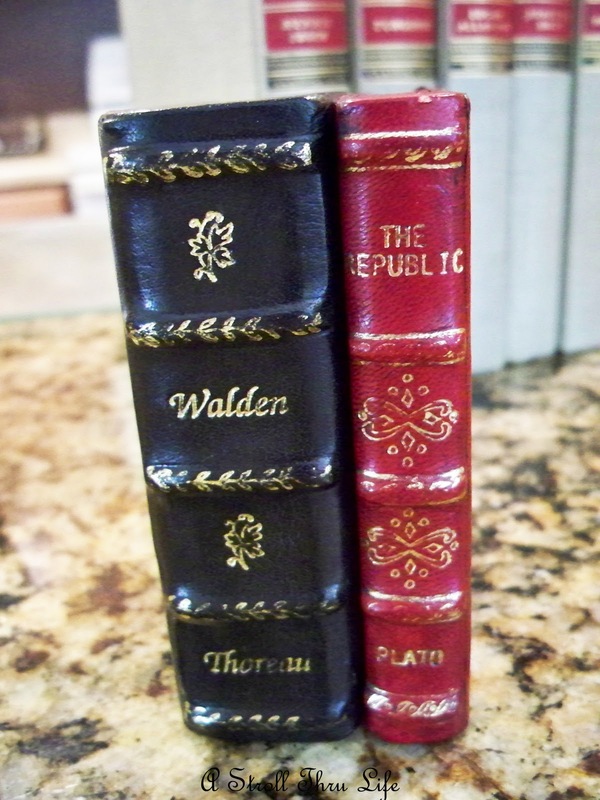 Books are a great way to add to your decor and collections. The silver piece is so shiny and pretty. great books at great prices.... lucky you!! I'm sorry to hear about the passing of your Mother In Law. I love your beautiful finds and yes it is good to treat yourself. Whenever I find a gift for my sister, I have to have one too! hugs to you my sweet friend. Hi Marty! 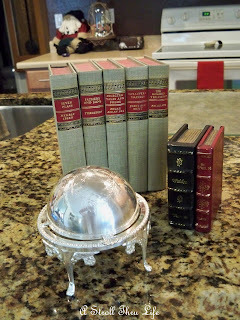 Great finds - those books and the little butter dish is gorgeous. I was gone all day yesterday and just read your MIL went to heaven. My prayers are with you and your family. Beautiful butter dish! You can probably find a clear glass bowl that would sit inside. Measure, make a note and take it along with a tape measure when you are out and about. Nice deal on the books. I really like my book boxes - wish I had room for more. Marty, I can not believe that butter dish was black! Talk about a diamond in the rough! Great finds! Oh my gosh Marty! that silver is gorgeous...love the engraving! Beautiful butter dish, Marty. I love your book finds too! Ooo...love the butter dish. I want to prop it open and fill it with flowers of some kind! Forget the butter:) You really got lucky at that price. Sorry about your mother-in-law. I hope finding these beautiful books and silver cheered you! I'm so crazy for old books. You found some beauties! I love them! Oh, and the silver is great too! Marty, I am just swooning over that silver butter dish. You did well with that holiday find my dear. That silver butter dish is such a treasure! I would have loved to see it black too, you must have really worked because now it looks brand new. I adore the mini books. They will be so cute tucked into some little vignette. Amazing finds! I stop into Goodwill regularly in search of classics. The books were great finds. Not only are they "keepers" but they have beautiful covers. I just read your post regarding your Mother-in-law, I'm so sorry that your family experienced such a devastating loss so close to the holidays. 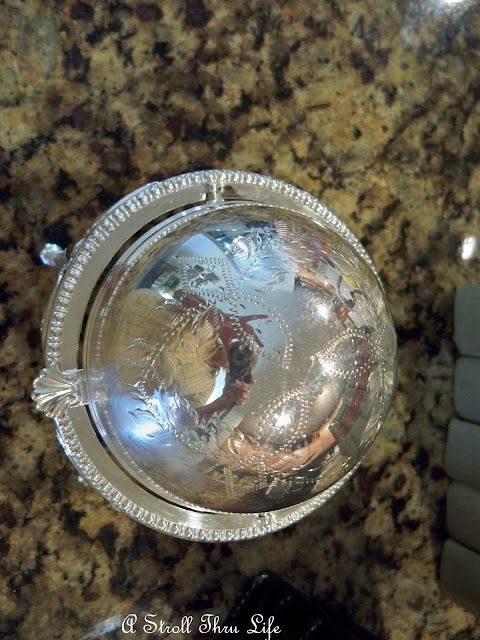 Marty, The butter dish is beautiful and what a wonderful suprise to find the engraving. I am always looking for old books to decorate with and you found some great ones. Marty, looks like you found a wonderful thrift! I love the butter dish and how gorgeous is it once you polished it! I am a book person so all those books are a fab find also. Thanks for joining JFF!! Wonderful finds! Love the butter dish...incredible! 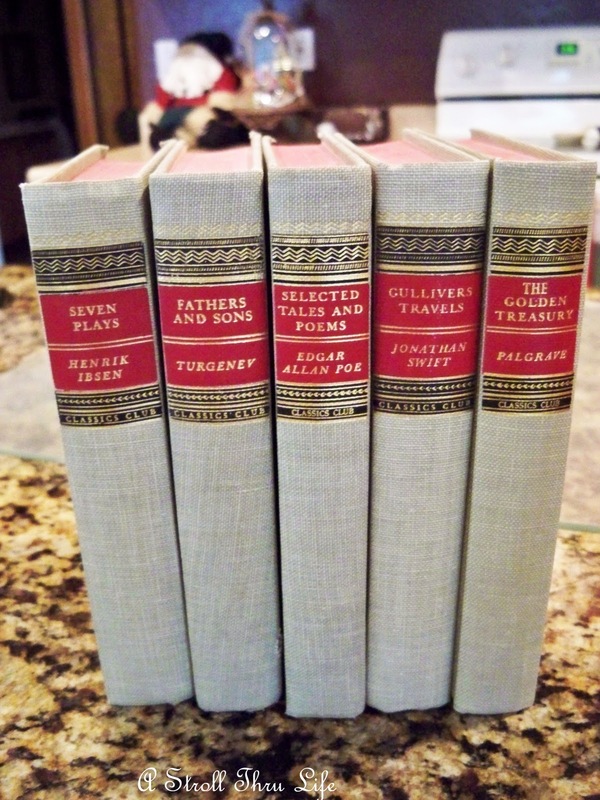 I love to collect sets of old books. I began collecting old books when I was in my 20's and I actually bought them to read! I don't think there is a room in my house that does not have books! You really scored on that gorgeous domed butter dish! You did a fabulous job cleaning it. Marty...we have the same passions...books and silver. Those are the very first things I look for and my shelves are loaded with books...I just go to my library...it's wonderful. And my silver...it's a joy to me. Especially bringing it home and polishing it and seeing what I really do have. I remember one day I walked out to the big dumpsters at the apartment buildings we were managing many years ago after Pat retired from the Marine Corp...and there was this big cardboard box FULL of silver. Trays...all sorts of things..and that's what got me started. Of course it was tarnished something terrible!! It's the polishing that is the biggest thrill...and I love your wonderful butter dish. You can always be on the lookout for a small glass insert for it. They are out there!! Lovely, just lovely! Love, LOVE, LOVE that butter dish!! Great find! 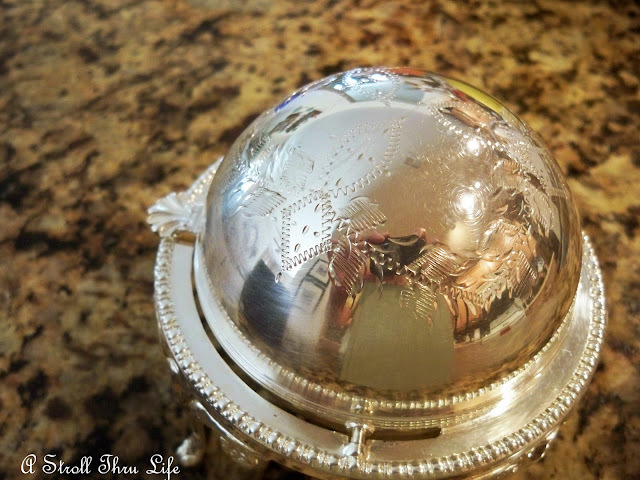 I had never seen a silver domed butter dish before. Always fun to learn something new. How beautifully it cleaned up! Love the books. A set of Mark Twain showed up in our GW this week as well, but I had found a different treasure to splurge on. I'll be sharing it in a while. You certainly found some lovely bargains. I, too, love old books and use them in vignettes constantly. Great hunt! I just want to thank you so much for your comment! And I also want to wish you a very blessed Christmas to you and your family. May God bless you in His Love and that 2011 is filled with wonderful surprises. I feel very fortunate that thru my blog I met so many special friends and you're one of them. I am grateful for that! Marty, those are wonderful finds. 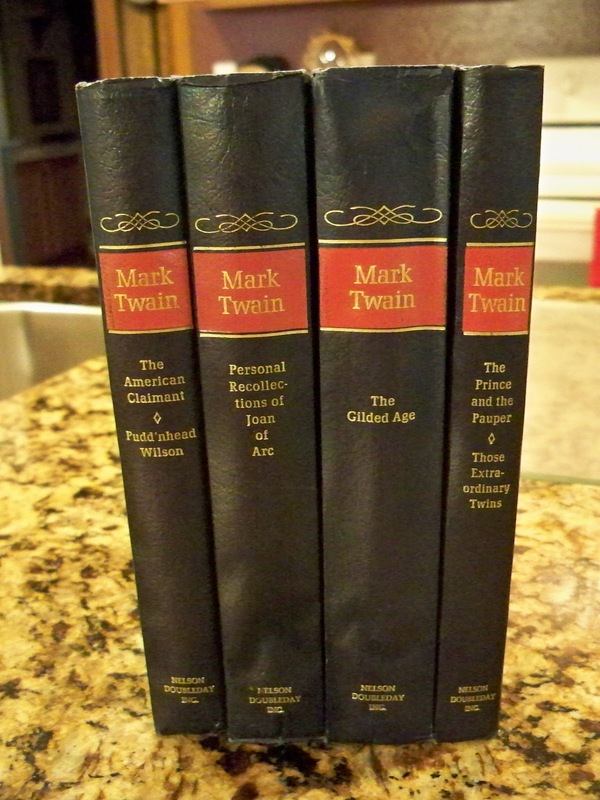 I love books anything by Mark Twain I would have grabbed in a heartbeat. Love that butter dome. I'm just dopping by to ask you to come to my blog today. I've made a "Thank you" note to my blogging friends and readers.